It revolutionized the concept of a children's book. Prior to the launch of Little Golden Books in 1942, children's books looked very different than they do today. As Mental Floss' Rob Lammie writes, kids' picture books often came in the form of hefty volumes etched with ornate illustrations. They were sold exclusively in bookstores and cost between $2 or $3, far more than most families could afford. Little Golden Books produced the top-selling children's book of the 20th century. That would be The Little Poky Puppy, which has sold almost 15 million copies since its publication as one of the original 12 Little Golden Books in 1942, according to Lammie. But this charming tale of a dessert-loving dog wasn't the only Little Golden Books hit. Titles like The Saggy Baggy Elephant (1947) and Scuffy the Tugboat (1955) also sold millions of copies, placing them among the 10 most popular children's books of the 20th century. In total, a whopping two billion Little Golden Books have been printed, according to Random House Kids, or, as the site puts it, "enough to reach the moon." Artists who fled Europe during World War II found a home at Little Golden Books. The publishers of Little Golden Books sought out talented commercial illustrators who had escaped the ravages of WWII, Neary writes. Among these illustrators was Russian émigré Feodor Rojankovsky. He brought several Little Golden Books to life, including Gaston and Josephine, a story about two pigs who run away from their homeland and start a new life in America. 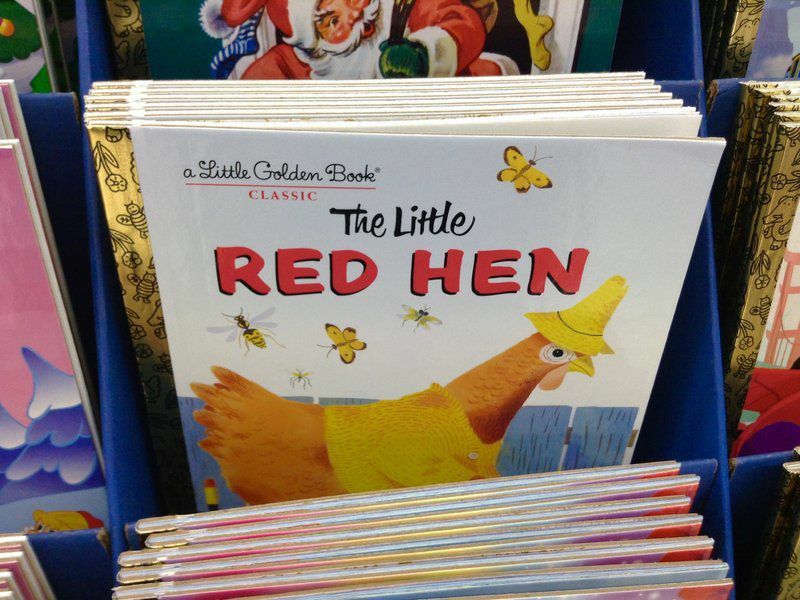 Little Golden Books has taken steps to address its biases. In the 1960s, the series was criticized for failing to depict any black children in a book about the Central Park Zoo, Jim Higgins reports for the Milwaukee Journal Sentinel. Though the publishers initially bristled at the allegations, they eventually released a line of books that prominently featured black protagonists. Richard Scarry, a beloved children's artist who got his start at Little Golden Books, revised his illustrations when feminists accused him of perpetuating gender stereotypes. Reprints of his books show, for example, female characters driving cars and male characters cooking in the kitchen. Little Golden Books has featured a whole lot of characters. Early Little Golden Books centered on either original characters or fairy tale creatures, but the series began incorporating pop culture figures into its pages after securing several licensing agreements. As Lammie writes, just about every kid-friendly character has popped up in Little Golden Books stories over the years, from Annie Oakley, to the Flintstones, to Disney princesses (so many Disney princesses). Even Donny and Marie Osmond made an appearance, in a 1977 Little Golden Book titled Donny and Marie: The Top Secret Project. 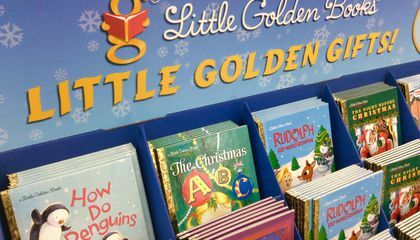 Seventy-five years on, Little Golden Books has gained a new publisher in the form of Penguin Random House, but the franchise has retained its spirit. New stories feature characters loved by kids today - Blaze and the Monster Machines!, Elena of Avalor!, Kung Fu Panda! - and the classics are still being printed, allowing new generations of readers to revel in the adventures of The Poky Little Puppy and The Saggy Baggy Elephant. Why were the books encased in a shiny, golden spine? Because the brand of the stories were called Golden so they wrapped it in a golden spine. To set different from all the other books.And to give off a more attractive look so draw in younger readers. The books were given a golden spine to show the readers that they were fun books for children. The old picture books were thick books that weren't appealing for people to read. Besides that, they were very expensive until the Little Golden Books came around and changed the original perception given when someone thought about a picture book. They looked pleasing and childish, while also being very cheap. Little golden books were always good reads for young children. They are the top selling book for younger children today. It makes sense the number 1 children's book gets a golden spine. This is so cool. I loved reading most of these books when I was little. This was fascinating. The books have golden spines for all the respect they had over the years. The Little Golden Books are very old books and still selling today, they are very popular books. The books deserve a golden spine for all the kids that loved their books. Little Golden Books is a brand of books with a golden spine. These books produced the best-selling children's books in the 20th century. These stories are not only entertaining, but also educational. I believe that the books had golden spines in order to properly distinguish them between other children's books. The golden spines were most likely their trademark. I normally do things to stand out and I kind of trademark myself from everyone else even though I'm not completely different from everyone. I believe that the books had a golden spine to set them apart from all the other children books, hence the name. it was their trademark. I can relate because most of the time i don't go with the trend i normally just do what i do (i made an exception for dancing). The little Golden Books company decided to have shiny, golden spins to attract the attention of little kids. Imagine a little three year old walking around the store and they see something shiny out of the corner of their eye. They will immediately walk over to it and pick it up.